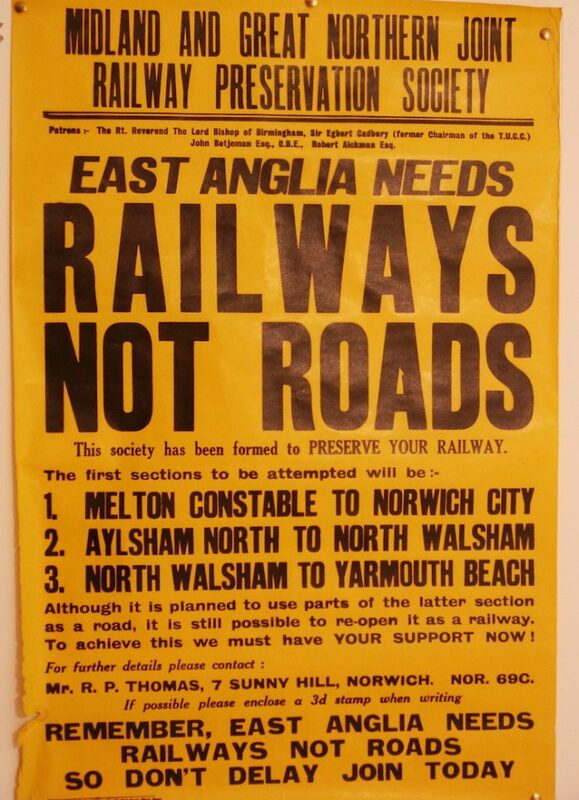 The Norfolk Orbital Railway project was created by David Rees, Trevor Bailey and David Bill who, in earlier years, were three of the founders of what has become the North Norfolk Railway. 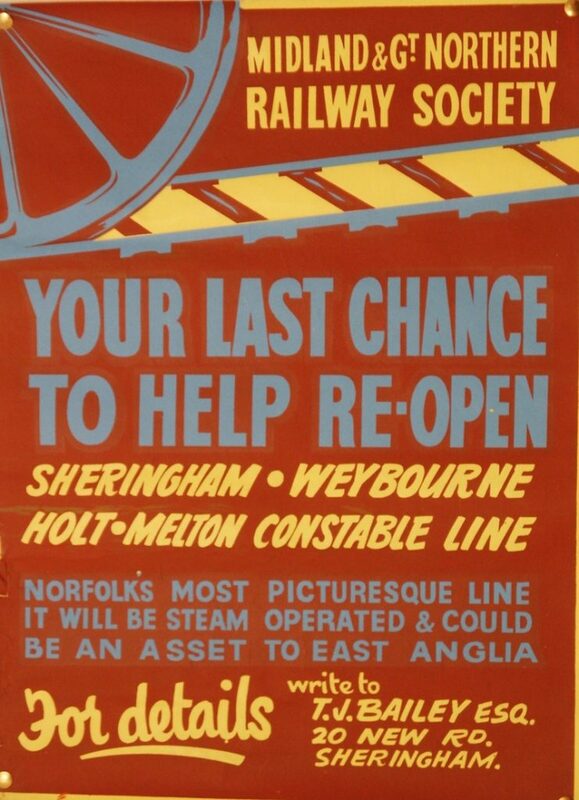 In 1958, David Rees was responsible for the initiative which, following the closure of the M & G N in 1959, led to the formation of the Midland & Great Northern Joint Railway Society and the company which purchased the Sheringham to Holt (High Kelling) line. All three held key posts in the Society and company for many years and were deeply involved in securing the line and in the early years of its restoration and the saving of iconic rolling stock. This was one of the earliest of such initiatives and at a time when the fortunes of the national railway system were approaching their lowest ebb. It was long before there were any grant sources available. Progress depended upon the support of the community and a vast amount of work. 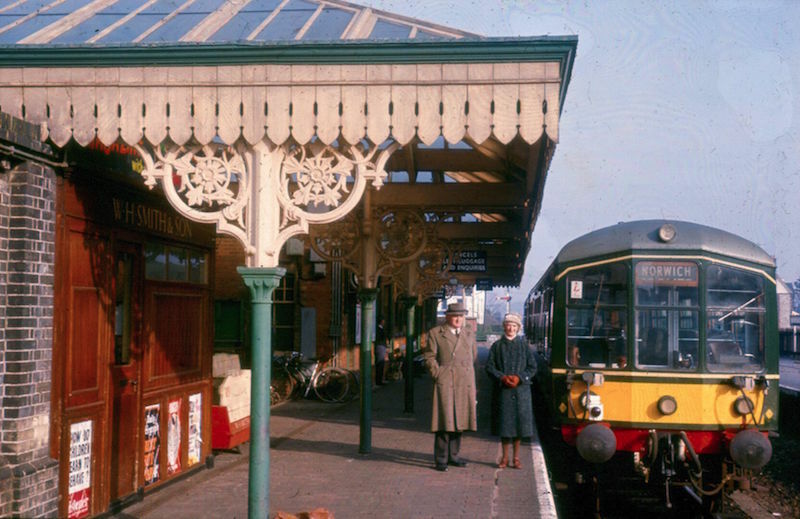 The three came together again in order to pursue the Norfolk Orbital Railway concept at the suggestion of John Tinkler, who was then the NNR General Manager. Crucially, this was to pursue the original purpose of the 1950’s initiative: the provision of a public transport, rather than heritage, service. There would also be opportunities for extended heritage operations but the central aim was to create a railway which would serve the main purpose of railways; conveying people and goods on journeys that they needed to make in the course of everyday life, both for work and leisure. Intrinsic to this was the desire to reduce dependence on road transport and to produce real environmental and social benefits. Trevor Bailey and David Bill grew up in Sheringham, travelling daily on the railway in British Rail days. Both David Rees and David Bill are from railway families, David Bill’s father having spent most of his working life at Sheringham Station, where he locked up the buildings for the last time under BR ownership. David Rees’s career was with the BBC. Trevor Bailey FRSA has worked in several branches of rural economic and community development, quite largely in the charity sector, and in rural media organisations which he has set up and developed, as well as chairing several major organisations including an EU funding body. David Bill MBE has had a long career in local government, at both County and District levels, including being Chairman of Leicestershire County Council. The original team was joined by Derek Haynes, who has worked at a senior level in several major financial institutions. These four became the Directors of the Holt, Melton Constable & Fakenham Railway Ltd. and the Trustees of its sister charity, The Melton Constable Trust. They have since been joined by John Hull, the Vice-Chairman of the Mid Norfolk Railway, with which we work closely. The title “Norfolk Orbital Railway” was coined by Paul Young, a former Chairman of the Mid Norfolk Railway. Paul led the successful Leader II European funded project to renovate County School Station. He also was actively involved with the application for £600,000 European and EEDA funding for Dereham station which was awarded in 2002. Paul is now our Project Officer, concentrating especially on the Fakenham end of the route. Paul lives in Norfolk and works full time in supply chain and logistics. Joe Penfold takes a similar role in respect of the Holt end and is the local liaison involved with the extension of the track into the town. David Rees, having been involved in railway affairs since 1958, retired as a Director and Trustee in December 2016 but retains a strong interest in the NOR project. Before anything was done to acquire parts of the NOR route, major professional studies were commissioned to establish that the project was welcome and feasible and that there was a real prospect of traffic and revenue. 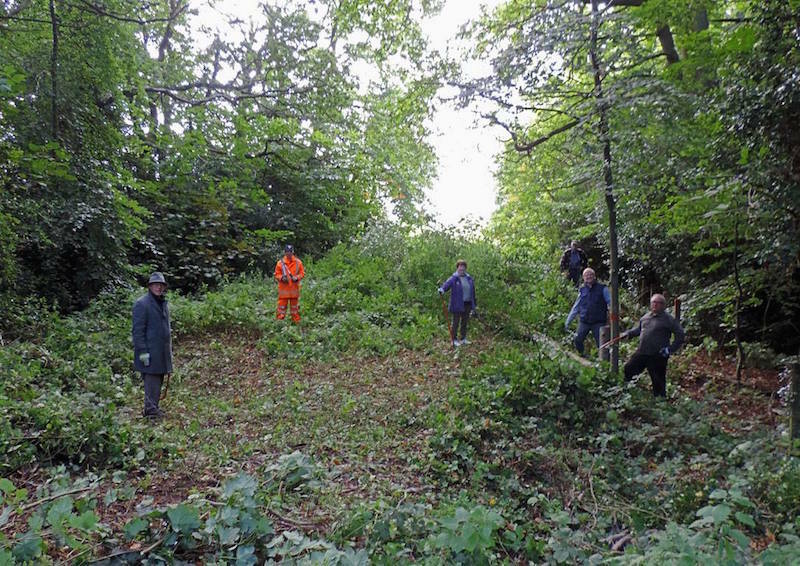 This was undertaken with substantial financial support from County, District, Town and Parish Councils, the former Regional Development Agency and other bodies. JICS carried out consultations with communities and institutions, with positive results. W S Atkins made an engineering assessment of the entire route between High Kelling and Fakenham, establishing technical feasibility. Peter Brett Associates undertook a study and modelling exercise, in line with those used for schemes on the national rail system, to assess traffic and revenue potential. Again there were very positive results. A great deal of work has followed, although the economic state of the country has curtailed financial support from local authorities and government agencies and slowed some initiatives. The strategy is first to acquire the track bed and other land required for the NOR route, concentrating initially on those sections necessary to build extensions from the Mid Norfolk Railway into Fakenham and from the North Norfolk Railway into Holt. 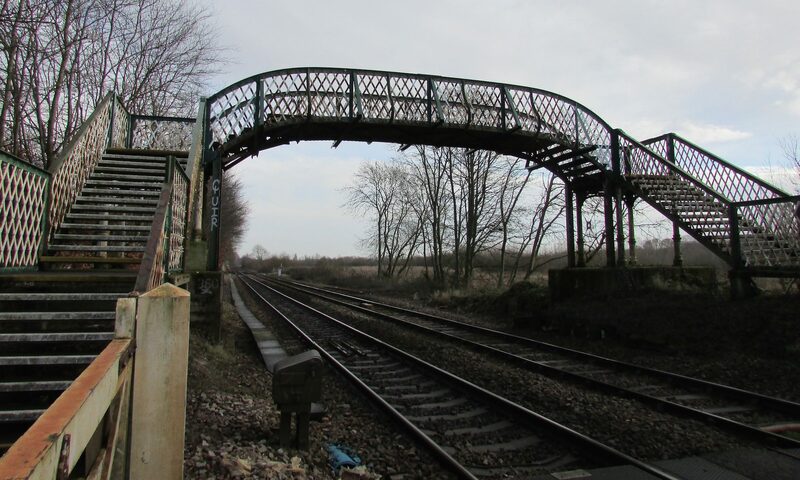 With great help from NOR supporters and from local communities, key land and bridges have been purchased at Fakenham and Holt, with more in the process of being bought. The Mid Norfolk Railway is actively extending its functioning railway northwards from Dereham towards Fakenham.